Quarantines 15, 24, and 55.
and geographic distribution of these fungi. amenability to various control measures. a downy growth of conidiophores on the surface of affected areas. liable to be transported in living parts of such hosts. For some species of Sclerospora conidia only are known. as successive crops no other stage is needed to maintain the fungus. Named species on corn, sugarcane, and rice. included in the rice quarantine (No. 55) but misspelled there. its coni'ia geminate by producing zoospores instead of germ tubes. oospores with seed of some other host. corn, but has not been reported to occur on corn in the United States. which attacks su'arcane and corn, and S. sohi which atTacs 'corn. S. sorghi is disseminated as oospores with sorghum or other seed. oonidia and to transport in living host tissues. also. Measurements by different workers vary and in the case of S.
would be very helpful in clarifying the situation. On corn conidia are produced in abundance by S. maydis, S.
be established and eradication effected. free eliminates the risk of introducir, Sclerosporas with such material. inated with oospores and should be handled with equal care. Foreign species on other hosts. by transport of contaminated sorghum seed in most cases at least. occurring on corn or sugarcane. Possible importance of these Sclerosporas in this country. oonidia should greatly restrict the length of any one "jump." Name of diseases Downy mildew, Green-ear disease. 1Jame of pathogen: Soclerospora graminicola (Sacc.) Schroet. Part attacked: Leaves, sheaths, stem above and below the ground level. First report from U. 8S. Wisoonsin, 1884. Distribution: Europe, Asia, Africa, North America. formation of numerous oogonia soon ends production of conidia. comparison is practical on basis of the information noted. typhoideum in India (5) the fungus causes "green ear disease"
oogonia. These spots are never conspicuous. settle and round up. Oogonia with heavy uneven walls. host 33-36.9 mu according to Weston and Uppal (42). Name of diseases Wheat downy mildew. Name of pathogens Soleropora macrospora Sacc. reported on corn in Australia and elsewhere. First report from Ue S.: California, Tennessee, Kentucky, 1921.
years in Tennessee and Kentucky). or at least remained wet for some time. damage in Europe at times. the low spots at all times. as S maorocarpa in the quarantine. also intergradations and combinations of these symptoms. in Italy (18), papillate, 60-70 x 38-52 mu on sort peduncles. Also obtained on infected wheat plant parts in water (19). shaped with the papilla well marked, 75-80 x 55-60 mu. Bibliography: (12, 18, 19, 29). Name of disease: Downy mildew. Hosts: Zea mays, hybrids of maize and teosinte. Part attacked: Leaves and other parts above roots. Country of first report: Java, 1897. First report from U. S.: None. Present distribution: Java, Sumatra, Belgian Congo (1937). of maize favor production of conidia and local spread. transport of living infected plants, so far as we know. Comparative losses: Said to be very destructive in Java at times. losses are not very important. for the promulgation of the corn disease quarantine, No. 24.
in general, only the bases of the leaves which are attacked. top leaves are normal green throughout. is by production of a germ tube. Bibliography (1I7, 20, 24, 32, ). Name of pathogen: Sclerospora miscanthi T. Miyake. determination used by T. Miyake (16). Country of first report: Formosa (found in February, 1911). S. macrosora which it is said to resemble. Methods of spread: No information. very limited and it only occurs over a small area. general statement used in the sugarcane quarantine, No. 15.
up into threads resembling those of millet affected by S.
fields, according to Miyake's fellow station workers. description but are said to be similar to those of S. sacchari. oospores and found mosT of them were 47-48.9 mu. in diameter. Name of disease: Philippine downy mildew of maize. Hostsi Zea mays, Euchlaena luxurians, Andropogon sorghum. Part attacked: Leaves and all parts except roots. Country of first report: India, 1912. First report from U. S.s None. Present distributions: India, Philippine Islands (1916). sporulate under favorable conditions. See above also. breeding for reslstar. varieties should be attempted. secondary parasites and killed or may produce a few grains. infected plants unless conditions are favorable. production of a germ tube, spores produced at night. Bibliography: (6, a, 24, 50, 35, 37, 38). Name of disease: Downy mildew of sugarcane. Name of pathogen: Sclerospora sacohari T. Miyake. Parts attacked: Leaves and stalks. Place of origin: New Guinea? of the fungus in or on sugarcane cuttings used for seed pieces. extreme differences in behavior of this fungus. (but see (43). several diseases, this being one of those named. is likely to be lighter and narrower than a healthy one. It may be noted that Weston (4I), when describing S.
north compared it with S. sacchari and stated that the"
the ooronial Sclerospora occurring on Saccharum spontftneum L.
two types of conidia mentioned by Miyake. Bibliography: (2, 3, 0o, 14, 16, 23, 26, 27, 35, 41, ). Name of disease, Downy mildew of sorghum. Name of pathogen: Solerospora sorghi (Kulk.) Weston and Uppal. Syns. Solerospora graminicola (Saoc.) Schroet. Country of first report: India (Bombay and Madras Presidencies), 1907. Present distributions India, Egypt, Tanganyika. of the disease by conidia. Losses incurred: Losses have not been heavy in any case apparently. humidity or other conditions it would be more destructive. Comparison of losses: Data inadequate. orop rotation should be effective. downy mildews" as used in the corn disease quarantine, No. tissues which turn brown from ooapores produced there. diseased seedlings are stunted and produce no ears. commonest and most prominent form of the disease. which turn from pale yellow to orange and then brown. there is no shredding. Normal ears are produced. sorghum and maize were the same, as observed in the field. germinating by production of germ tube or hyphae. 4.3 mu, usually 1.1-2.7 mu thick (42). fibres. This stage does not occur in corn. Bibliography: (5, ., 9., 13* 15. 2! *, 5, W) ). Name of pathogen: Sclerospora spontanea Weston. by inoculation, Euchlaena luxurians, Miscanthus japonicus. Country of first reports Philippine Islands, 1921. Present distribution: Visayan group of the Philippine Islands, Siam. in the seedling stage o5.ly. serve to spread the disease as in other Sclerosporas. host might spread the disease. pinenss which causes losses up to 50% or more of the crop. with respect to other hosts. clumps on which the downy mildew persists year after year. (37). Germination by formation of a germ tube. nearly alike that they may belong to one species. which the fungus persists and produces conidia. Bibliograh: (j, 24, L5, 37, 38, 41). fit those of S. graminicola and S. maydis (Rac.) Palm fairly well. Butler is now S. philippinensia Weston which has far larger conidia. but not in corn. Bibliography: (21, 22). sorghum. The fungus on corn may be that species also. are quite similar and it is possible the oogonia of both S.
oogonial forms on one or more of these hosts. Spore measurements of Sclerosporas of corn, sugarcane, and rice. 1924 Departmental Activities: Botany. Journ. Dept. Agr. 1929 Bureau of Sugar Experiment Stations; Queensland Agric. in 5 of 71 plantings surveyed in Giru district in April 1929. 1929 A Key for the Field Identification of Sugar Cane Diseases. Causal agent Slerospora sacchari Miy. Diagnostic characters, transmission & control discussed. (4) Bottcmley, A. M. and Doidge, E. M.
Veterinary Conf. Pretoria, Aug. 1 17, 1929. Agric. Sect. of the fungus noted Ts not yet known with certainty. 1918 Fungi and Disease in Plants. 547 -p.p 206 figs. Solerospora graminicola on Pennisetum typhoideum and S.
1913 The downy mildew of maize. Memoirs Dept. Agr. India, Bot. Ser. 51 275-280, May, 1913. Solerospora ph1ipp inensis discussed under the name S.
(7) Doidge, E. M. and Bottomley, A. M.
Africa. Mem. Bot. Surv. So. Africa No. 11. 78 pp. Natal coast and in the Transvaal. Usually unimportant. and Slerospora (?) 1graminicola on Eragrostis spp. (p. 26) but it seems likely S. sorghi is referred to. graminicola (Saoc.) Schroet. of Bajra and Jowar. Mem. Dept. Agric. in India 5: 268-273. 2 pl. May. Separates form on sorghum as S. graminicola var. of germ tubes instead of zoospores as in the species proper. Note: Bajra Pennisetum typhoideum and Jowar sorghum. (10) Lee, H. A. and Medalla, M. G.
1921 Leaf Stripe Disease of Sugar-cane in the Philippines. measurements of the conidia, 17-28.8 x 11.4-15.2 mu. of which S. maydis Butler is a synonym. 1930 Sclerospora macrocarpa in barley. Phytopath. 20- 107. 1931. Report of the Imperial Myoologist. Sci. Repts. Imper. Inst. Agric. Res., Pusa. 1932-33, pp. 134-160. Panioum trypheron, first report on host. 1932 Report of the Imperial Mycologist. Imper. Inst. Agric. Res., Pusa. 1930-31, pp. 73-86.
path. 21t 239-240. (Feb.) (Abstract in Rev. Appl. Mycol. where Kulkarni established this species as a variety of S.
parasitic fungus, Sclerospora sacohari T. Miy. Bul.Div. (Transle by Mr. Hirode & Dr. D. S. North in Library files). (Bull. printed Mar. 28 and published Mar. 30, 1912). translation made from a copy loaned to Dr. Weston by Dr. H.
been found recently and closely resembled that of S.
1918 Onderzockingen over der omo lyer von de mais. Dept. Landb. Nivj. en Handel (Dutch East Indies), Meded. Lab. Plantenziekten, No. 32, 78 p., 8 pl. English summary, p.
oospore della 'Sclerospora macrospora' Sacc. Bol. R. Staz. Pat. Veg., N. S. 101 153-164. (Abstract in Rev. Appl. 1929 Gli zoosporangia nella Sclerospora macrospora. Boll. R.
Staz. Pat. Veg. N. S. 9f 353-357* (Abstract in Rev* Appl. cells of which constrict bases making them easily detached. by production of zoospores which soon lose cilia and round up. in water instead of air. 1897 Leijer, Eine Gefahrliche Maiskrankheit. Ber Deut. Bot. 1922 Ann. Rept. of the Gov't. Mycologist for 1921 in Ann. Rept. Dept. Agric. Uganda for year ending Dec. 31, 1921. pp. L9-57. which induces the same disease in India. Circ. No. 8, pp. 1-27.
tion being based on symptoms. (23) Stevenson, John A. and Rands, R. D.
S. miscanthi, S. philippinensis, S. sacchari, an S.
Palm) au Congo beige. Scientific bull. No. 13 of the I.N.E. (25) Storey, H. H. and McClean, A. P. D.
material was studied by Dr. "'Aeston. 1931 A note on the downy mildew of sugarcane in India. Said to be Sclerospora sacchari. 1916 Dr. Swingle says "...... in February, 1916, Mr. S.
saccharin as described from Formosa by T. Miyake. (28) Takasugi, H. and Akaishi, Y.
in Manchuria. I. About the germination of oospores. pp. 1-20, 8 pl. 19533. (Japanese with English abstract. Abstract in Exp. Sta. Rec. 70: 489-490. 19534 and in Rev. 19532- Additional list of the fungi of Manchuko. Trans. Sapporo Nat. Hist. 13: 185-190. 19534. (Abstract in Rev. Appl. Mycol. 13: 804. Dec., 1934). Rice was attacked by Sclerospora oryzae Brizi. (50) Uppal, B. N. and Weston, W. H., Jr.
1956 The basis for merging Sclerospora indica with S.
differences S. indioa is reduced to a synonym of S.
has a tendency to be slightly narrower. (51) Uppal, B. N. and Desai, M. K.
Bombay. Phytopath. 22: 587-594. Illustr. June, 1952.
became infected as compared to 534.4g of Golden Bantam. (32) Van Hall, C. J. J.
to 509 of crop. S. javanica is now a synonym of S. maydis. 1933 Report of the Mycologist. Ann. Rept. Dept. Agric. trial grounds, another variety was practically immune. 1937 A revised list of plant diseases in Tanganyika Territory. East African Agric. Journ. 2t 305-310. Ja. No. 4. Scleroapora sp. reported on corn, S. sorghi on sorghum. (35) Weston, W. H., Jr.
97-122. 12 pls. (2 col.) May 1, 1920.
the pathogen, here named Sclerospora philippinensis. (36) Weston, W. H., Jr.
1921 The occurrence of wheat downy mildew in the United States. U. S. Dept. Agric. Circ. 186. June, 1921.
in 1919. Found on Bromus c ommutatus as well as wheat. (7) Weston, W. H., Jr.
1921 Another conidial Sclerospora of Philippine maize. Journ. paper on Philippine downy mildew of maize. wide. As few as 200 spore measurements give the same ratios. (38) Weston, W. H., Jr.
of conidia of Sclerospora philippinensis and S. spontanea. conidia may continue for weeks, up to two months or more. probably means of distribution to new and distant areas. (39) Weston, W. H., Jr.
(h40) Weston, W. H., Jr. and Weber, Geo. F.
( Setara maa) or Everglademillet in Florida 1922. (41) Weston, W. H., Jr. 2hctetochoa.) by S. graminicol. Conidia not knomn. doubt on validity of S. miscanthi, S. sacchari, and S.
accompanied by more leaf splitting. (142) Weston, W. H., Jr., and Uppal, B. N.
1952 The basis for Sclerospora sorghi as a species. Phytopath. 22: 573-586. June, 1932. 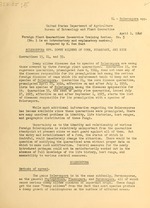 1939 Report of the Division of Entomology and Pathology. in Thirty-ninth Ann. Rept., pp. h5-59. Queensland Bur. Sugar Expt. Stas. (Australia). 1939.
leaves of Natal 6, but nothing from the other varieties. land Milo, and American Early Red." seemed to be necessary to produce daily sporulation. Bvorglade millet infected with S. &roxinicola (left) and healthy (right). fterglade millet stunted by long standing systemic infection. Shredding of tops following formation of oospores. p-plae rough Aih i oospores emerge at germination. gerSeon is by formation of hyphae. C, D.-Germination of a oonidia. E.-Conidiophore with oonidia beginning to form. have begun to dehisoe. I, J.-Septation of basal cells. (From Publ. Inst. Nat. Etude Agron. Congo Beige Ser. Scient. showing ohiorotie condition oaused by 8. philippinensi. Ti. 25 days after emerging from the soil. (C & Dj and sheath (9). A and B. Btiolated marking due to S. ph4l4ppinesis on maize natural size. Saooharum spontaneumj F and H from augaroeane).